The mainstream media is trying to keep the truth from We the People once again. A local reporter at a small station just unearthed some more shocking news about George Soros’ plot to harm America. 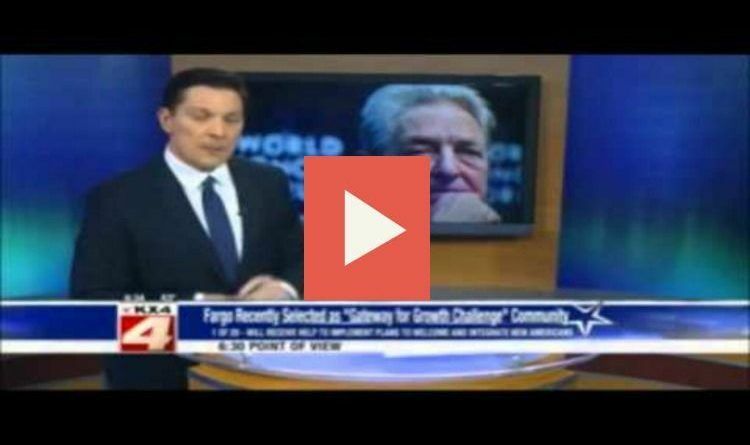 George Soros and his Liberal open society minions are planing to bombard America with Muslim refugees, according to a North Dakota television reporter. Soros was one of Hillary Clinton’s biggest backers and donors. Soros has both the power and the money to accomplish such a nefarious goal. His numerous foundations all have happy and positive sounding names, but the inner-workings of the groups are deviously anti-American in nature. Some of the George Soros’ organizations, which the reporter said could be used to flood the United States with improperly vetted Muslim refugees, include his Partnership for A New American Economy (PNAE) and Welcoming America. Don’t think your town is safe from George Soros’ reach. His plot to overwhelm America with Muslim refugees from the Middle East extends to small towns across the nation, the reporter added. How will Soros get this done? With money, of course, lots and lots of money. The Liberals bribes will be disguised as grants and donations to non-profits and communities both large and small, according to the journalist. One of Soros’ most commonly handed out “rewards” is his Gateway for Growth Award. The Gateway for Growth Award comes with a plethora of strings attached. The funds must be used to “educate” the citizens on the “merits” of immigration expansion. Here’s just a sampling of some of the American cities and counties which have already accepted both the Soros’ funds and the mandae which comes along with the money: Akron and Summit County, Ohio; Anchorage, Alaska; Birmingham, Alabama; Brownsville, Texas; Columbus, Ohio; Fargo, North Dakota; Houston, Indianapolis; Kansas City, Kansas and Missouri; Lancaster, Pennsylvania; Macomb County, Michigan; Nashville, Tennessee; and the state of Arizona as a whole. This is Soros’ plot to destroy America and our way of life. It’s coming folks and that’s why Donald Trump was elected because he saw the attack on our liberty and CONSTITUTION. Let’s wake up before it’s too late.